The upper end of the movable jaw is directly suspended on the eccentric shaft. As the crank-link mechanism, the connecting rod of the jaw crusher working simulation diagram is directly driven by the eccentricity of the eccentric shaft, and the lower end of the movable jaw is connected to the rear wall of the frame by the thrust plate on. When the eccentric shaft rotates, the trajectory of each point on the moving cymbal is from the circumferential line of the suspension point (the radius is equal to the eccentricity), and gradually becomes elliptical downward. The lower the part, the more the ellipse is biased until the lower part and the thrust plate. The connection point track is a circular line. Because the movement trajectory of each point on the moving cymbal is complicated, it is called a complex oscillating jaw crusher. Compared with the simple pendulum type, the compound pendulum type jaw crusher has the advantages of lighter weight, less components, more compact structure, better filling in the crushing chamber, uniform crushing of the loaded material block, and lowering of the lower end of the jaw. Mandatory introduction of finished product discharge, so the productivity is relatively low, 20-30% higher than the productivity of the simple pendulum jaw crusher of the same specification; the material block has a large up and down tumble motion in the lower part of the movable jaw, which is easy to be in the shape of a cube. Unloading reduces the sheet-like composition as in the simple pendulum product, and the product quality is good. 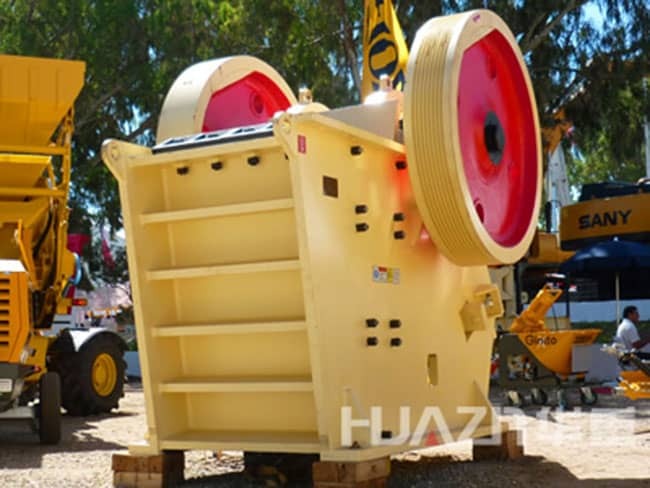 The jaw crusher (smashed) is divided into two types: simple swing jaw crusher and complex swing jaw crusher. Their working principle is very similar, and the moving track of the moving jaw has a big difference. The simple oscillating jaw crusher is suspended on the support shaft because the moving jaw is reciprocating, and the movement trajectory of each point on the moving cymbal is circular arc, and the horizontal stroke is small and large, and The bottom of the moving (at the discharge opening) is the largest. Due to the ore falling into the crushing chamber, the upper part is a large nugget, which often does not reach the amount of compression necessary for the ore to be broken. Therefore, the large ore in the upper part needs to be repeatedly crushed several times to be broken. Most of the crushing load is concentrated in the lower part of the crushing chamber, and the entire jaw is not evenly operated, thereby reducing the productivity of the crusher. At the same time, the vertical stroke of the crusher is small, the grinding and stripping effect is small, and the discharging speed is slow. However, the wear of the seesaw is lighter and the product is less pulverized. The complex oscillating jaw crusher, because it is the connecting rod of the crank linkage mechanism, the trajectory of the upper point of the moving cymbal is approximately elliptical, and the ellipticity is upper and lower, and the upper part is driven by the eccentric shaft. Approximately round. The horizontal stroke of this crusher is exactly the opposite of that of the simple pendulum jaw crusher. The upper part of the upper part is smaller and the upper horizontal stroke is about 1.5 times of the lower part, so that the amount of compression required for the crushing of large ore in the upper part of the crushing chamber can be satisfied. At the same time, the vertical stroke of the whole moving cymbal is larger than the horizontal stroke, especially at the discharge port, and its vertical stroke is about 3 times of the horizontal stroke, which is conducive to promoting mine discharge and improving production capacity. Practice shows that under the same conditions, the production capacity of the compound pendulum jaw crusher is about 30% higher than that of the simple pendulum jaw crusher. However, the wear of the seesaw is fast and the product is severely crushed.